Wales have no fresh injury concerns ahead of their World Cup Pool A decider with Australia on Saturday. Warren Gatland's team had injury concerns over full-back Liam Williams (concussion), flanker Dan Lydiate (eye) and second row Bradley Davies (nose). But attack coach Rob Howley said everyone was fit for the match at Twickenham. "We have a clean bill of health. It's the first time I've been able to say that over the past six weeks," he said. "We have a fully selected squad to choose from so we're looking forward to naming the side on Thursday." That also means that prop Paul James, who made a brief appearance as a replacement in Wales' opening win against Uruguay, is also available for selection. Wales lost Jonathan Davies, Leigh Halfpenny and Rhys Webb to injury before the tournament, and have seen centres Scott Williams and Cory Allen plus wing Hallam Amos ruled out by injury during the World Cup. England's 33-13 defeat by Australia means Wales have already reached the quarter-finals, with their match against the Wallabies to decide who finishes top of Pool A. The group winners are likely to face either Scotland or Japan, with South Africa the expected opponents for the runners-up. Howley added that Liam Williams, who was concussed in Wales' key 28-25 win over England, had served a statutory seven-day break and could play against Australia. Australia will be without flanker Michael Hooper who has been suspended following a citing commission hearing on Tuesday. 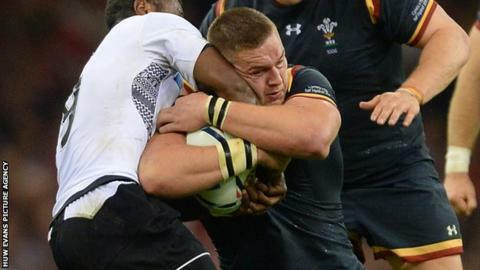 He has been banned for a week for an illegal shoulder charge on England's Mike Brown. Australia also have an injury doubt over full-back Israel Folau, while wing Rob Horne is likely to miss the match. But Howley believes Australia are better placed than most countries to deal with those injuries. "If you look at the strength and depth they've got in the backs - the Quade Coopers, the Kurtley Beales - we are well aware of what Australia are able to select from, particularly in the high numbers [backs] their strength is quite outstanding," Howley said. "The hardest thing when you play them is the defensive aspect because of the players they've got, their ability to beat a player and the combinations they've selected. "If you look at the amount of experience they've got, especially in World Cups, it's about mastering the moments and Australia did that really well against England."